Twin Arrows and Toonerville are a Ghost Town, located on the 1926 to 1960 alignment of Route 66. See the old Trading Post at Toonerville, the iconic "arrows" at the Twin Arrows Trading Post, with its Valentine Diner and trek out to the Historic Route 66 bridge built in 1914, close to the Twin Arrows Navajo Casino Resort. Elevation 5,879 ft (1.793 m). Population n⁄a (2010). 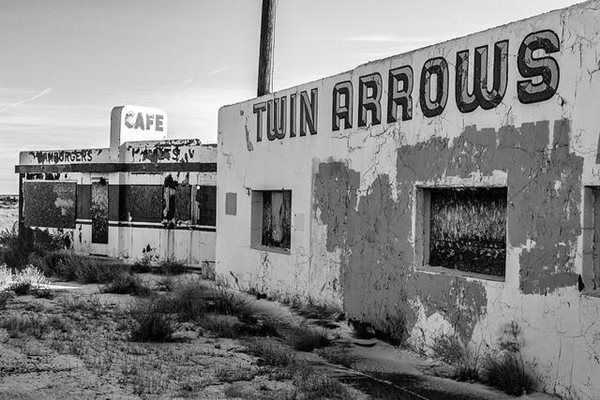 Twin Arrows is a ghost "town" located on US Route 66 in Coconino County, in the central part of Arizona. It is just one mile west of Toonerville, another abandoned trading post. See a Map of Twin Arrows. 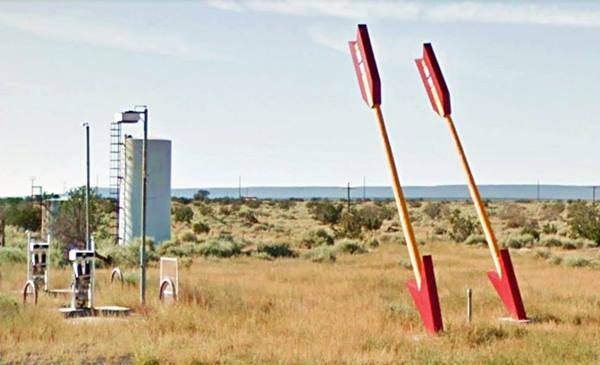 For the early history of Twin Arrows, please see the History of Winslow or Flagstaff, which are both very close to the now abandoned "town" (actually a trading post). The legend of the "Lost Mines of the Padres" originated during the Spanish Colonial period in New Mexico. Basically it tells about fabulous silver mines in the region that were operated by Franciscan missionaries (the "Padres", which in Spanish means "Fathers", that is, priests). They were attacked by a tribe of Indians en route to their base in Santa Fe, NM, in 1767, most of the group was killed near Canyon Diablo, but a group of missionaries survived and reached Santa Fe. The wagon roads that were surveyed shortly after Arizona became a part of the US following the Mexican American War of 1846-48 ran further north, closer to the Little Colorado River. A shorter route between Flagstaff and Winslow was surveyed in the 1880s, and was chosen by the Atlantic and Pacific Railroad (later acquired by the Atchison Topeka and Santa Fe Railroad) to build the railroad along it. The railway passed to the north of the modern alignment of Route 66 and I-40 and the station of Hibbard was built to the east of Canyon Padre; a few miles to the west was Angell station followed by Winona. The land formed part of the Navajo and Hopi reservations. Dates back to 1954, and may be a counterpart to the neighboring "Two Guns". They are unlikely the "Twin Arrows" of Eros in Iphigenia in Aulis, that, in marriage not only bring lifelong content but also ruin and confusion. In the Middle East, two mantic arrows were consulted when faced with travel problems: "Safr" "go ahead", and "Khadr" "stay put"; their arrangement could tell the traveller what to do. The Book of Mormon mentions a kind of compass, with two arrows, the Liahona (1 Nephi 16:10); were the owners of the Trading Post Mormons? A shorter road was chosen for the wagon and automobile highway built by the National Old Trails highway association. It ran along a straighter course from Two Guns to Winona, and crossed the Canyon Padre at the sight where Twin Arrows and Toonerville are now located. Route 66 was aligned along the National Old Trails in 1926 and traffic began flowing through Twin Arrows & Toonerville. The Toonerville trading post was built along Route 66 and later, the Twin Arrows post was opened further west. Read more below (Recent History). >> Book your Hotel in Twin Arrows. 35 miles. Motels and Hotels in Winslow. 68 miles. Motels and Hotels in Holbrook. 114 miles. Motels and Hotels in Chambers. 224 miles. Motels and Hotels in Grants. 23 miles. Motels and Hotels in Flagstaff. 35 miles. Motels and Hotels in Bellemont. 57 miles. Motels and Hotels in Williams. 74 miles. Motels and Hotels in Ash Fork. 100 miles. Motels and Hotels in Seligman. 136 miles. Motels and Hotels in Peach Springs. 171 miles. Motels and Hotels in Kingman. 25 mi from Kingman, Motels and Hotels in Yucca. 29 mi from Flagstaff Motels and Hotels in Sedona. 30 mi from Williams Motels and Hotels in Valle. 52 mi from Williams Motels and Hotels in Tusayan. Motels and Hotels in Grand Canyon Region. Twin Arrows has a climate that is intermediate between the dry and arid Winslow weather and the less dry and more wetter conditions that prevail in Flagstaff. Its rainfall is around 10 inches (254 mm), snowfall is around 15 inches (38 cm). The average high temperature in Twin Arrows in summer (July) is 90°F (32°C). The winter (Jan) average high is 42.5°F (5.8°C). The average low in summer is 50.9°F (10.5°C) and in winter it is 17.3°F, well below freezing (-8.2°C). It is sunny in Twin Arrows and only 55 days per year are days with precipitation. There are no tornados in Twin Arrows. As it is located to the west of the Rocky Mountains it has no tornado events at all. You can reach it very easily along Interstate 40, heading west from Winslow or east from Flagstaff. Map showing Route 66 in Twin Arrows, AZ, by A. Whittall. 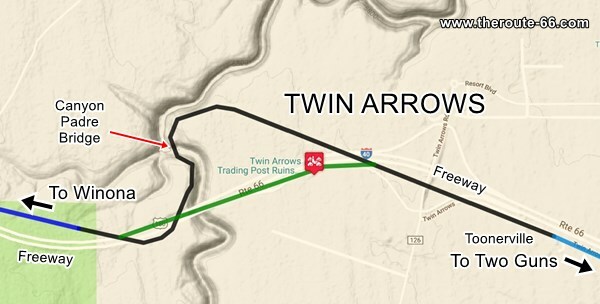 Map of Route 66 in Twin Arrows. Check out Twin Arrows on our Route 66 Map of Arizona, with the complete alignment and all the towns along it. Pale Blue: Driveable 1926 to 1952 Route 66 alignment. Black: there is no road to drive, but you can still make out the original roadbed (1926 - 1937). Green: The alignment from 1937 to 1952 through Twin Arrows and westwards. Blue: The 1926 to 1952 alignment of Route 66 west of Canyon Padre and all the way into Winona. The gaps are where the old road is now buried under the freeway (I-40). The historical Route 66 sites of Toonerville and Twin Arrows are now almost ghost towns, with empty trading posts on the old Route 66 alignment. After crossing the bridge over Canyon Diablo (at Two Guns), there is a stretch of 10 miles until reaching Toonerville. He mentions "A single building providing gasoline, groceries, and lunches. ", he also points out that west of Toonerville the Coconino National Forest with its pine trees appears gradually, replacing the dry plains. He mentions the bridge across Padre Canyon, 2 mi. west of Toonerville and says the canyon is "quite similar to Canyon Diablo". He adds nothing more until reaching Winona, 10 miles west of the bridge. Both are names of now defunct Trading Posts, both were located on the east side of the Canyon Padre. The first one was Toonerville, and it is the one mentioned by Rittenhouse in his book, in 1946. Then came Twin Arrows in 1954. The name that remains is the latter, as it was adopted for the neighbouring Casino Resort. It is only 0.5 miles east to Toonerville (Map with directions), this is the Exact location of Toonerville. The Trading Post builiding is still standing, but now it is a private property, and a home. The flat roof has been replaced by a gabled one. It was built at a key location at the junction of the road to Mormon Lake (28 mi. to the southwest) and Route 66. 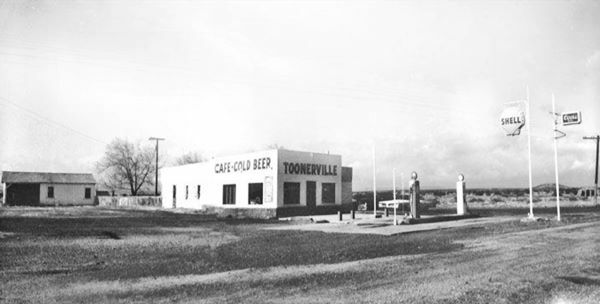 It was, as shown in the photograph, a classic Route 66 Trading Post with whitewashed walls proclaiming its name in capital letters: "TOONERVILLE" and "Cafe - Cold Beer". It has a Shell sign, but a few years later, during the 1971 killing, sold Conoco gasoline. The "cold case 1971 killing". On August 30, 1971 two African American couples hit on the Trading Post ran by Merritt "Slick" McAlister and his wife Perl. They robbed the place, murdered Merritt and shot his wife in the head, but she fortunately survived. The killers were never caught. The 70's had their quote of violence. The name is quite odd, but has an explanation: the Toonerville Folks was a very popular cartoon published in newspapers between 1908 and 1955. It was first published in the Chicago Post and was syndicated nationally in 1913. The cartoons are set in a town named Toonerville and included a tramway and many interesting characters. It is likely that the owner of the trading post chose a familiar name that would inspire a cheerful mindset in his potential customers, and a cartoon did just that (like naming a place "Moe's Tavern" - from the Simpsons- nowadays). Only 0.6 miles west of Exit 219 along Old Route 66. See this Map with Directions. It was originally named the Canyon Padre Trading Post, after the Canyon just west of it. 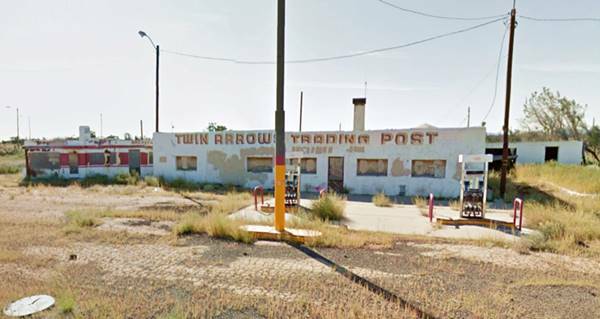 In 1954 it was renamed Twin Arrows Trading Post. It was run by the Troxells, Jean and William between 1955 and 1985. Despite the fact that I-40 bypassed it, the nearby Exit ensured a constant flow of visitors. The original store sold Mobile gasoline and also had a Valentine Diner as well as the classic "Twin Arrows" sign made from two telephone poles. The store closed in 1990, reopened shortly in 1995 but later shut for good. 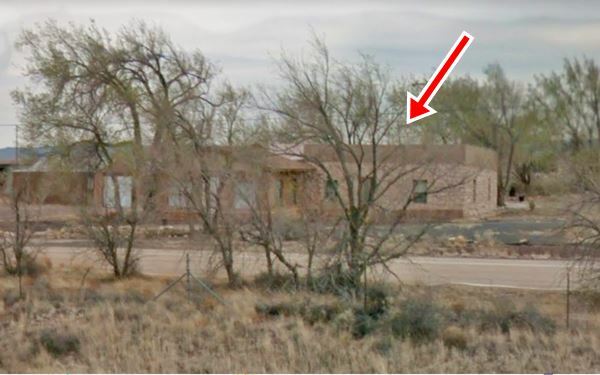 The Hopi tribe and Route 66 supporters restored the decrepit arrows and renovated the building, but it is still closed. Twin Arrows Trading Post on US 66. Note the Valentine Diner with the "Cafe" sign. There are other Valentine diners on Route 66, for instance the restored Valentine Diner at Edgewood, NM, the Winslow Arizona Valentine or the Albuquerque Valentine Diner Police Substation. A Diner is a classic example of Route 66 "Americana" (More on Americana). Diners were prefab restaurants, defined as "a restaurant shaped like a railroad car", the name derives from "dining car". The Valentine diner at Twin Arrows was one of at least 2,000 diners built by the Valentine Manufacturing Company of Wichita, Kansas. They were prefabricated, ready-to-use mobile diners which came with all the fittings (stools, tables and counters) plus a kitchen area. They were available in different sizes and models. They were invented by Arthur Valentine (1891 - 1954) who began producing them in 1947. After good growth during the 1950s, the company gradually lost business in the 1960s and folded in 1975, the fast food chains and suburbia had displaced the small diners and drove them to extinction. Head east and visit Two Guns, the Barringer meteor crater, Meteor City, Winslow on the NM state line is Lupton. Go west and visit Winona and Flagstaff. Heading west from Twin Arrows towareds Winona, the countryside changes and small pine trees and junipers appear dotting the now vanishing desert. The road climbs into the Arizona Plateau, a table-land which rises all the way to Flagstaff, and the scenery becomes forested. To the west you can now clearly see the snow capped summits of volcanic San Francisco Peaks around Flagstaff. These are relatively young volcanoes (6-million-years-old) and the highest one is Humphreys Peak which is the highest point in the state of Arizona (12,633 ft - 3.853 m). Old Route 66, Twin Arrows, AZ. This centennial bridge (built in 1914) spans the Canyon Padre gorge at Twin Arrows. The bridge is a concrete Luten arch bridge with cantilevered roadway (Daniel Luten patented this strong yet light type of bridge). The deck is concrete over an earth fill. It is 148 feet long and has a 125 ft. span (45.1 and 38 m). It cost $ 7,900 which adjusted for inflation is $188,375 of nowadays. 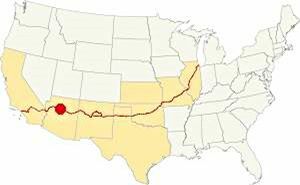 It is 12 years older than Route 66 because it was built on the National Old Trails highway (or Arizona Santa Fe highway). When Route 66 was aligned through the area in 1926 it adopted the course of the National Old Trails roadbed. It is now on the abandoned grade of U.S. 66, which was replaced in 1937 when the paved road was built with a straighter course just to the north of Twin Arrows (now under I-40's roadbed). This alignment avoided the dangerous curves that approached the old bridge. Now it is used for local Navajo traffic. The bridge is located here (Map showing Exact Location of the Bridge). The Route 66 bridge crosses Canyon Padre with a north to south direction. It is very close to Exit 219 at Twin Arrows, but cannot be reached from the east because its access road is in private property. You can reach it from the west, driving to Winona and returning towards Twin Arrows along AZ-394. This Map with directions shows how to reach the area next to the bridge from Winona. But it does not take you all the way to the bridge, 6.8 miles east of Winona, it becomes a rough and tricky dirt track and a regular car cannot cope with it. You will have to walk the last part of the road, roughly one mile as the road curves northwards towards the bridge. Located on the north side of I-40's Exit 219, it is a Navajo casino complex with adjacent hotel, multiple dining rooms, table games and slots. Click on this link for the detailed Route 66 alignment between Winslow and Two Guns. West of Two Guns the 1915 -1930 roadbed of Route 66 can be seen, but it is no longer a road that can be driven. The later 1930s alignment lies under I-40. However at I-40's Exit 225, you can head to the south side of the freeway and drive a tiny section of the original 1915 - 1930 road. The road west of this exit is once again overlaid by I-40. The 1926 alignment of Route 66 reached Toonerville along what is now the South Service Road of I-40, which is now truncated in its eastern tip. The original road followed the National Old Trails highway, and kept on straight west (now partly hiden by the earthworks on the south side at Exit 219), it reappears on the north side of I-40 and runs straight until reaching the Canyon Padre, where it sharply curves south, crossed the Canyon via the Historic concrete bridge, and then curves towards the west again, passing to the south and then again to the north of I-40. It then continued west along what is now AZ -394, towars Winona. This alignment is shown in the Route 66 map above, in Black (roadbed which cannot be driven), Pale Blue: Driveable 1926 to 1960 Route 66 alignment east of Toonerville, Blue: The 1926 to 1952 alignment of Route 66 west of Canyon Padre and all the way into Winona. In 1937, a new bridge was built to replace the dangerous 1914 one. It was built where the eastbound lane of I-40 is now located, leaving the old bridge and its curved access abandoned. The eastern 1926 alignment was linked to the bridge with a new roadbed from what is now Exit 219, passing by the current Twin Arrows Trading post and meeting the 1926 alignment on the western side of Canyon Padre, on what is now AZ-394. This is shown in Green on the map above. This roadbed remained in use until 1952, when a new alignment (under I-40) was built west of the Canyon Padre all the way to Winona from what is now Exit 219. The road east of the Canyon was moved in 1960 to an alignment that is now located under I-40s roadbed, and the 1937 -1960 road in front of Twin Arrows and Toonerville was abandoned. This alignment remained in use until 1979 when I-40 replaced US 66. Red shows the post-1952 alignments now under I-40 (see map above). The whole of the old (1926 - 1960) Route 66 alignment in Toonerville and Twin Arrows that can still be driven, is a 2.2 mile segment. Click to see the Toonerville - Twin Arrows US 66 map (with directions). There are two parks which are relatively close to Twin Arrows: the Petrified Forest National Park and the Homolovi State Park. To the west, near Flagstaff there are several parks, suich as the Sunset Crater Volcano National Monument, Walnut Canyon National Monument and Slide Rock State Park.